New Year's Eve can be a fun night for parents AND kids without keeping kids awake until midnight! By the time Christmas ends and New Year's Eve rolls around, I usually can't even stay awake until midnight myself. We love to start the partying earlier in the day and then get everyone to bed at a reasonable time so that we can start off the New Year with happy well-rested kids. For the past few years I've had fun celebrating New Year's Eve with my kids as toddlers and preschoolers. This year I get to plan our family's NYE celebration (7 kids, ages 8 and under), so I thought I would gather some of my favorite ideas all in one place! I will be pinning more ideas throughout the week on my New Year's Eve Activities for Kids Pinterest Board as I discover additional ideas. These activities are some favorites that we have tried in the past. Please share additional ideas that have worked for you or any variations on these ideas that you have tried! Last year we tried out New Year's Eve countdown bags inspired by Organize Your Stuff Now. Inside each bag we put a little treat and a slip of paper with a quick activity on it. Some bags also included the materials we needed for the activity (if they fit). Some of the activities we did are listed below. Each activity lasted about 10 minutes although if the kids were having fun and really got into the activity, some lasted longer. We started our New Year's Eve celebration at 7pm and it lasted until 8pm when we did our celebration. In previous years we've done a countdown starting at 5pm or earlier depending on the kids. In addition to count down bags, we've loved using a balloon pop countdown. We loved these creative New Year's Eve crowns from Pink Stripey Socks in 2016, and this year they have some fun Plastic Spoon New Years Crowns that we may be trying. We decorated our crowns with sparkles and markers and crayons. You can get really fancy using all sorts of embellishments if your kids really like decorating crowns. In addition to decorating crowns, we've enjoyed building M&M numbers using an outline drawn on a piece of paper. The New Year's Eve Dot Marker Printables from The Resourceful Mama would be great to use for this activity too since the kids could put one M&M in each dot. 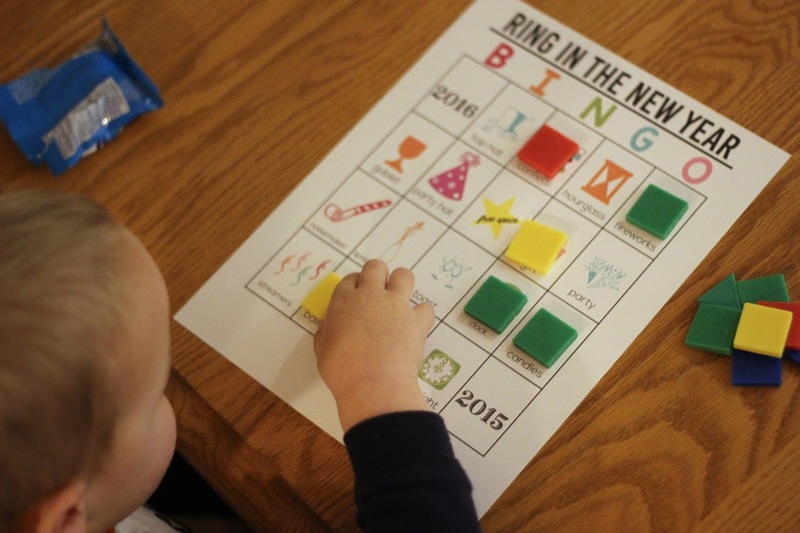 We've loved the New Year's Eve printable BINGO sheets from 30 Handmade Days. We use little plastic tiles as counters to cover each spot. Sometimes we use M&Ms as well... but since my littler kids tend to inhale the M&Ms, large plastic counters work the best. I like these sheets because they include pictures for younger kids and words for older kids. 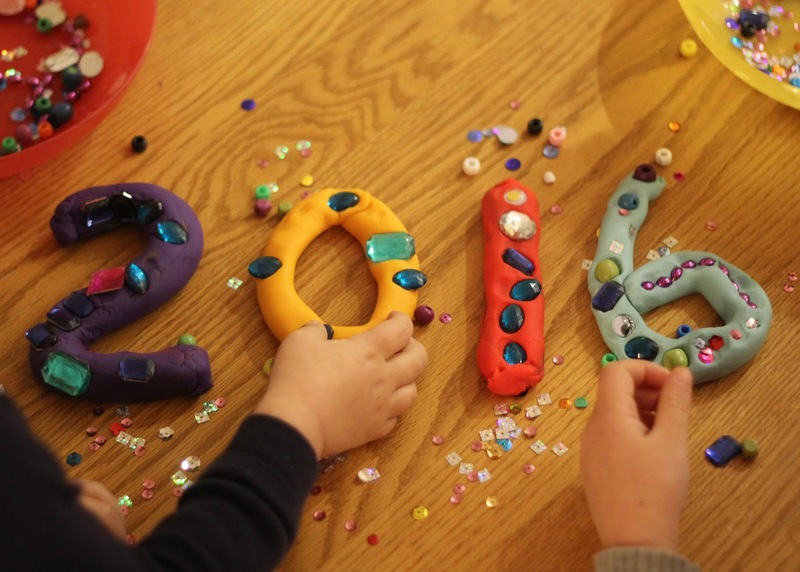 For our sparkly number play dough activity we like to build the number for the new year out of play dough and then we give the kids bowls of beads and sequins and gems and they get to decorate the numbers. I am always surprised at how long the kids spend decorating and looking for jems and jewels. For younger kids who still try to eat everything, make sure to make your numbers bigger and use larger embellishments (non-choking hazards). Pom pom shooters are one of our favorite things. Making a New Years pom pom shooter that blasts colorful pom poms everywhere is always a hit! We use styrofoam or paper cups and cut off the bottom of the cups. Check out this pom pom shooter tutorial by Red Ted Art for more details. These are such a colorful and fun way to celebrate the new year! No matter how fun our NYE activities are, glow stick hide and seek always wins the "best activity" award because the kids love playing it again and again and again. We take turns and have one or two kids hide all of the glow sticks in a dark room. Then the other party people go and find the glow sticks. Then we repeat it again and again. Everyone gets a chance to hide the glow sticks and everyone gets a chance to find the glow sticks. Last year my kids played glow stick hide and seek for at least 30 minutes. Our family loves Minute to Win It Games. 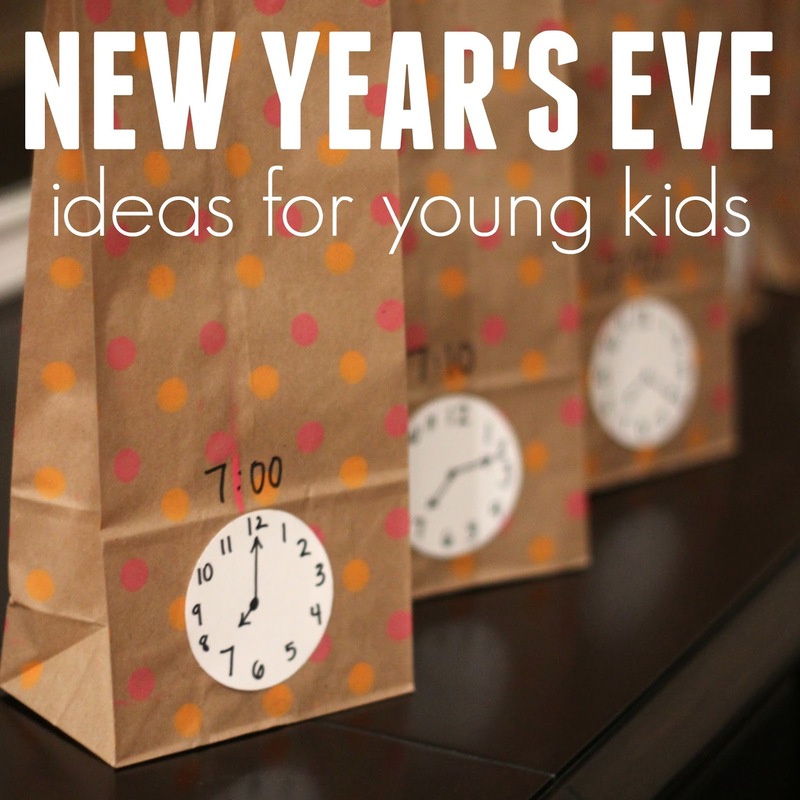 These New Year's Eve Minute to Win It ideas from The Idea Room look awesome. We are going to try the countdown knock down and the ball drop (that is similar to jingle in the trunk that we've played before). 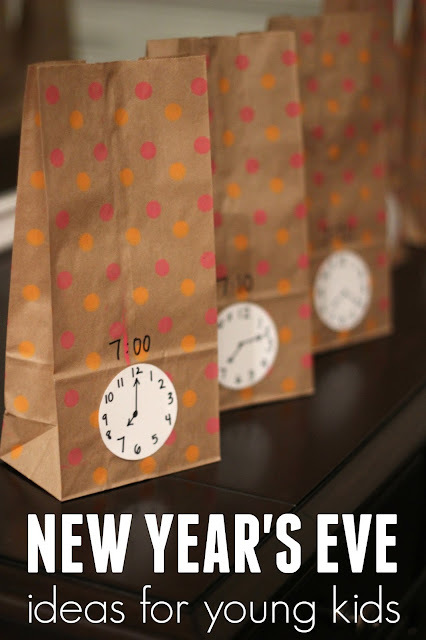 There are so many fun New Year's Eve snack and treat ideas compiled over at Kids Activities Blog. 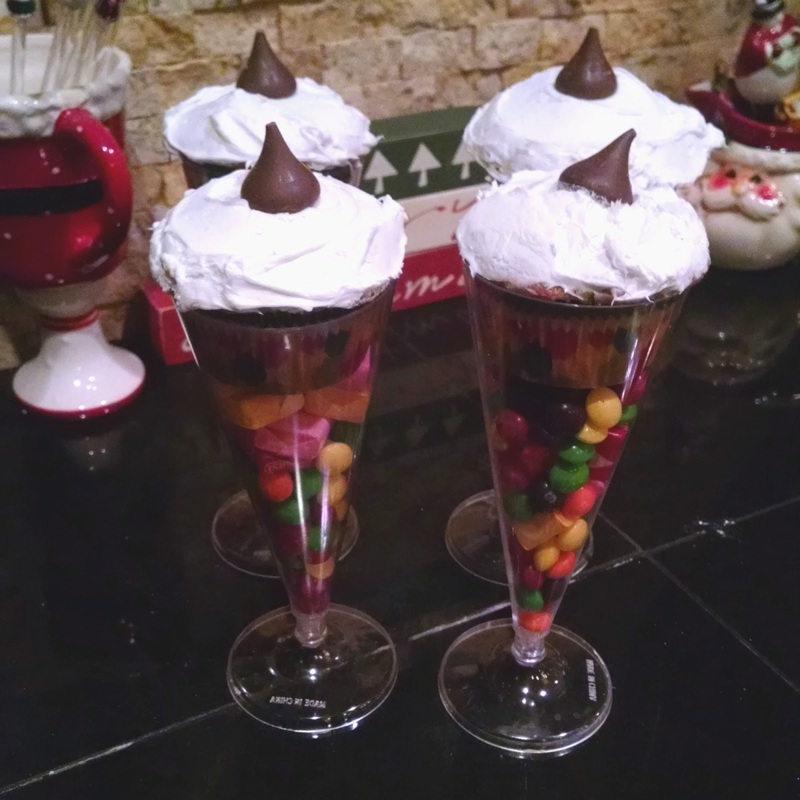 We love creative and yummy drinks and my mom loves making cute treats using cupcakes and candy in tall glasses. If you aren't a fan of candy and cupcakes, add in some fishy crackers or colorful cereal and a muffin. I also love the idea of making giant pizza numbers in the shape of the new year for a snack! There are several different types of shakers/noisemakers that you can make with kids for New Year's Eve. You can do a bubble wrap noisemaker, an easy plastic cup noisemaker, or a paper plate noise maker. We have made different variations each year. In addition to these 10 ideas, I've pinned several other NYE activity ideas over on my New Year's Eve Activities for Kids Pinterest Board. If you have any other favorites that you've tried with preschoolers and toddlers, pass them along! We hope you have a fun New Year's Eve!